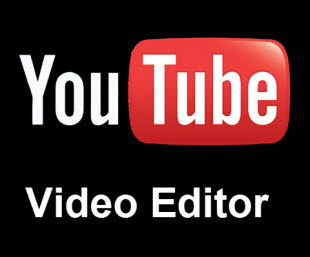 Roundup of top 10 free online video editors. Best free video editor for Windows (10) PC and Mac will be also provided. Editing video online can be easily realized so long as you have a reliable free online video editor at hand. Normally you can upload videos to online video editing websites and do some editing operations, and then download the edited video in the original format or some other supported formats the service provides, or you can leave it in the cloud service. In most cases, the online video editing services only offer limited output formats. If you want to save the edited video to other formats, you are suggested to switch to a more stable and powerful free video editor & converter. Here we list top 10 free online video editors and a stellar free video editor for both Windows (10) PC and Mac for your reference. Hope they'll be helpful in editing and converting videos online and offline. As the best rescue to free online video editors, this desktop free video editor & converter not only enables you to trim, split, crop, expand, rotate, flip, deshake, denoise video, add effects/watermark/subtitle video, convert video to GIF, but also aids you to convert video to almost all popular formats/devices like MP4, AVI, MOV, FLV, MP3, iPhone X/8/7/Plus, iPad Pro/Air, Galaxy S9/S8, etc. 100% clean program. What Are the Limits of Free Online Video Editors? The way how online video editor works also indicates its limits. 1. You have to rely much on Internet connection to upload and edit video. If the Internet is not stable, the video editing operation may fail. 2. It's not sensible to edit and convert large size videos online, it would be vitally slow. 3. Even if some free online video editing software provides different output formats after editing video online, the supported file formats are very limited. 4. Uploaded video size also has limitations. Normally free video editors online can only edit small or medium size videos. A 1GB movie video may be not supported. 5. Editing features are also limited. 6. The operation is complicated. You have to upload the video onto the services, edit it, and then download it again to computer. 7. Freezes and instability often occur. 8. Saving the edited video may require your email. Some adware, malware, virus may be also downloaded, which may put your computer at risk. Can't edit video with free online video editors? Turn to a more stable Windows (10) free video editor & converter – WinX HD Video Converter Deluxe. It also provides a Mac version. WinX HD Video Converter Deluxe is a very powerful yet extremely easy-to-use video editing and converting program compatible with Windows 10/8/7, etc. It supports trimming, cropping, expanding, merging, rotating videos, adding effects, watermark, external SRT subtitles to videos, and adjusting video/audio parameters to get desired output size & quality. Acting as more of a top video converter for Windows (10), it uniquely supports converting multi-track MKV, M2TS, AVCHD and HDTV videos, as well as converting between AVI, MP4, H.264, HEVC, WMV, MPEG, FLV, MOV, 3GP, TS, MOD, and more. Fastest conversion speed and best output quality can be assured thanks to its Nvidia/Intel/AMD hardware acceleration and High Quality Engine. Free download and install WinX HD Video Converter Deluxe on Windows 10/8/7/Vista, etc. or download its Mac version, and follow the detailed guide below to easily edit, trim, crop, merge, rotate, subtitle video, etc. and save to preferred output format. Launch the best free alternative to online video editors. Click "Video" button on the main UI. Then click "+Video" button to select and load the source video file to the program from computer. In the Target Format column, choose your preferred output video format. 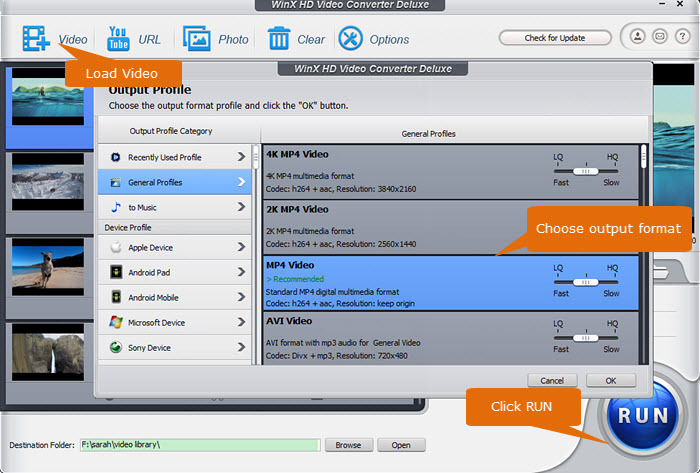 Then you can do some video editing operations with WinX HD Video Converter Deluxe. Trim: Freely cut video clips and merge into one. Subtitle: Choose inner subtitles or add external SRT subtitles. Crop: Crop video to remove black bars or unwanted areas. Auto expand video to fit profile screen resolution. Rotate: Rotate video 90/180/270 degrees. Flip video vertically or horizontally. Watermark: Add text/image watermark, time stamp to video. Merge: Combine several video clips into one output file. Click "Browse" to set a target folder to save the edited and converted video. Hit "RUN" to start editing and converting videos at superfast speed. Instead of using free online video editors, you can use this trustworthy best free video editor & converter for Windows (10) and Mac to edit video and convert video as a piece of cake. -	Edit video: Cut, split, crop, rotate, flip, merge video. Add effects/watermark/subtitles to video. Adjust video and audio settings.